Poor Sweets Cheeks wasn't very well at the weekend. It was a bad sign on Friday when he refused food and said he had a tummy ache. I went to bed early on Friday night as I had a feeling we were in for a bad night and I wasn't wrong. Come Saturday morning, Sweet Cheeks was confined to a Designated Puking Area, which I told him was a special camp we were going to play in for the day. I put every blanket, duvet, towel and pillow on the floor in the sitting room and we hunkered down in front of CBeebies for a serious Tummy Bug Rejection Strategy. By the afternoon, whatever the problem had been was safely stashed in the washing machine and normal services were resumed with the mass destruction of about ten sausage rolls, some ginger biscuits and a packet of prawn cocktail crisps! The new Challenge over at MMCS Challenges is a Card for a Teen. I came across this fabby image a few weeks ago and knew I needed her for this. 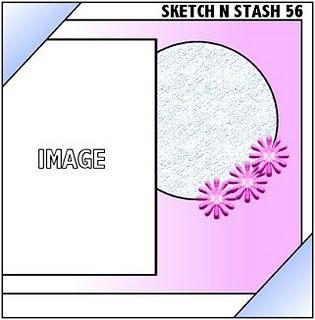 When I was thinking about how to incorporate her into a card, I remembered this sketch from a while back (Week 56) at Sketch n Stash and then things fell together quite nicely. Oh poor SC, Hope he is feeling better today. Fab card Faye - love the layout. Sorry to hear the little one has not been well - hope he is better now. Oh wow I love how you've used the rope for her to climb on!!! AWESOME!!! Fabulous card Faye, I like the image on the rope, brilliant! I love your card Faye ! I love how you made your digi rope climbing thats a very cool idea! First of all....glad Sweet Cheeks is feeling better now. LOVE this card. Very creative and she actually looks like she's scaling that wall! Glad Sweet Cheeks is feeling better...your card is gorgeous.....love the cool image and your colouring is stunning! Oh Faye this is awesome! I love the design and the colours are perfect! So pleased to hear Sweet Cheeks is feeling so much better. Good thing I am a nurse cause I sat and ate my lunch while reading about Sweet Cheeks with no problem whatsoever! Love the card and how you used the sketch, great coloring as always! Wow, wow, wow Faye...me likes it a lot hun...and I hope Sweet Cheeks is on the mend now...bless..! I love how you created motion and depth with this card...it's done perfectly! A perfect layout for your image hon, love the twine rope! Hi Faye! How wonderful - I love this!! Such cool colours too! Love the rope detail too. 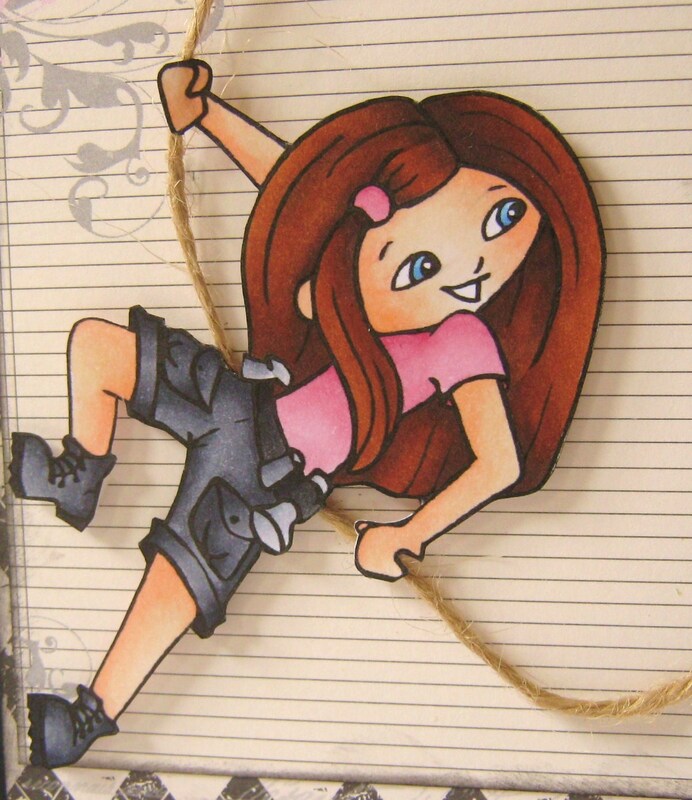 Sounds like you weathered the Sweet Cheeks storm okay Faye:) Love that fun image and fab climbing rope you made for her !! GREAT card! So cute and fun! I love how you have her climbing the rope! A fabby card Fluff, I love the string you have added for her rope. This is fun, and love the used of twine here, brilliant idea!!! Glad to hear that Sweets Cheeks is on the mend. Love the card Faye, great use of the fab image. I'm back home now so I'll send you an email. Very cute Faye! Love that rope! I love this card Faye! I LOVE those papers and the image looks fab with them! The rope is a great touch too! Wow this is awesome! Love the image you have used and the gorgeous layout super cute! To answer your question, we try to keep an eye out for LMMS projects and your Agent Cupcake was one my teammie found - so glad she did too! :D You're welcome to enter it into the current challenge if you'd like as it qualifies for "Anything Goes!" I really like your Agent Cupcake card. Love the sentiment! Thank you so much for joining our challenge at Little Miss Muffet!